“You have created this magnificent study program with excellent teachers that are so interested in us learning. The atmosphere in class, the way you all teach and are open to all our needs, makes it an extraordinary learning experience. You should be very proud!" I am glad I went with your program." 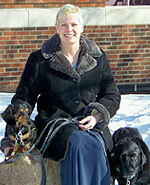 Dr. Janet Van Dyke is a 1981 graduate of the University of Illinois College of Veterinary Medicine. She completed her internship and surgical residency at the Animal Medical Center in New York City in 1984. Practicing orthopedics and sports medicine, Dr. Van Dyke saw many canine patients that could benefit from rehabilitation therapy. 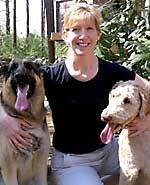 In 2002, she founded Canine Rehabilitation Institute, Inc. to train and certify veterinarians, physical therapists, and veterinary technicians in canine rehabilitation. Dr. Van Dyke lectures nationally and internationally and consults regularly with state veterinary and physical therapy boards on legislature issues related to veterinary rehabilitation. A long-time board member of the Veterinary Orthopedic Society (VOS), Dr. Van Dyke is currently serving as president. She has been the chair of the Residency and Credentials Committee and served on the Public Relations committee for the American College of Veterinary Sports Medicine and Rehabilitation, and is past president of the American Association of Rehabilitation Veterinarians (AARV). 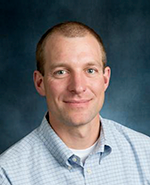 Dr. Van Dyke was named an affiliate faculty member in the Department of Clinical Sciences at Colorado State University's College of Veterinary Medicine and Biomedical Sciences. She is co-editor of the textbook, Canine Sports Medicine and Rehabilitation, 2nd Edition (Wiley, 2018). Dr. Kara Amstutz is the Owner and Medical Director of Hometown Veterinary Hospital & River Canine Rehabilitation in Springfield, Missouri. She is a 2000 graduate from the University of Missouri College of Veterinary Medicine. She was certified in Canine Rehabilitation through Canine Rehabilitation Institute (CRI) in 2013. That same year, she earned her Certification in Veterinary Pain Management through the International Veterinary Academy of Pain Management. In 2019, she achieved her credential as a Certified Veterinary Acupuncturist through the International Veterinary Acupuncture Society (IVAS). She has been in practice ownership since 2002 and her scope of practice has become primarily pain management and rehabilitation for a variety of patient issues. Dr. Amstutz is currently a resident in the American College of Veterinary Sports Medicine and Rehabilitation. Dr. Amstutz helps teach Introduction to Canine Rehabilitation and The Business of Canine Rehabilitation course. Dr. Myra Barrett earned her DVM from Colorado State University. She did her residency at CSU, focusing on equine diagnostic imaging and training with equine imaging experts in the U.S. and around the world. She received a master's degree through the Orthopaedic Research Center at CSU and is a Diplomate in the American College of Veterinary Radiology. Dr. Barrett is the head of the equine diagnostic imaging service at CSU. Her primary research and clinical interests are musculoskeletal imaging and comparative imaging, and she works closely with the equine surgery and canine sports medicine services. Dr. Barrett teaches Diagnostic Musculoskeletal Ultrasound with Dr. Felix Duerr. 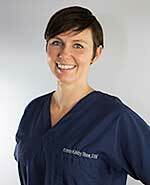 Dr. Cara Blake earned her DVM degree at Ross University School of Veterinary Medicine in 2007. She completed a rotating internship in small animal medicine and surgery at Angell Animal Medical Center in 2008. She then completed a small animal surgery residency in a joint program with Tufts University Cummings School of Veterinary Medicine and the Angell Animal Medical Center. She became a Diplomate of the American College of Veterinary Surgeons in 2012. Dr. Blake was certified as a Canine Rehabilitation Therapist by CRI in 2014. She has also completed has completed coursework in veterinary acupuncture at the Chi Institute. She previously worked as an Assistant Professor of Orthopedic Surgery at the University of Pennsylvania School of Veterinary Medicine and staff surgeon at Massachusetts Veterinary Referral Hospital. She is currently an Assistant Professor of Surgery at the Oklahoma State University Center for Veterinary Health Sciences. Her areas of clinical and research interest include minimally invasive orthopedic surgery, use of regenerative therapies for the treatment of musculoskeletal injuries, osteoarthritis, clinical outcome assessments for orthopedic patients and pain management. Dr. Blake co-teaches Introduction to Canine Rehabilitation and Canine Rehabilitation Veterinary Nursing. Dr. Julie Churchill graduated from the College of Veterinary Medicine at Michigan State University in 1988 and did her small animal internship in medicine and surgery at the University of Georgia. She completed a residency/PhD program in small animal internal medicine and clinical nutrition at the University of Minnesota College of Veterinary Medicine in 1993/96, where she is currently serving as Assistant Clinical Professor in Companion Animal Nutrition. Dr. Churchill’s interests include obesity prevention and weight loss management, critical care nutrition, the nutritional management of kidney diseases, and the role of nutrition in integrative medicine. She teaches Nutrition in Canine Rehabilitation. 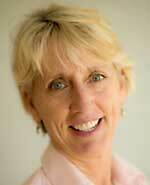 Judy Coates is a 1986 graduate of Boston University's master's program in physical therapy. In her human practice, she specialized in orthopedic and sports physical therapy with particular interest in manual therapy and biomechanics. As an associate professor of physical therapy at Boston University, Judy taught Evaluation of Orthopedic and Sports Conditions, Treatment of Orthopedic and Sports Conditions and Joint Mobilization of the Spine and Peripheral Joints. She conducted research at the National Institutes of Health, investigating the biomechanics of gait. In 2006 Judy completed her certification at Canine Rehabilitation Institute. She founded her rehabilitation practice, Coates Canine Physical Therapy, in 2007. She has been on faculty at CRI since 2009 teaching Introduction to Canine Rehabilitation and Canine Rehabilitation Therapist. Judy is a contributing author to the textbook Canine Sports Medicine and Rehabilitation, 2nd Edition (Wiley, 2018). Wendy Davies began her career in the animal field as a zookeeper after completing a dual program between the State University of New York at Oswego and Santa Fe College in Gainesville, Florida. She graduated in 1994 with a BS in Zoology and an AS in Zoo Animal Technology. 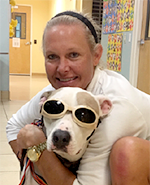 After spending a couple of years working at small animal general veterinary practices, Wendy moved to the University of Florida Veterinary Teaching Hospital to take a position as an anesthesia technician. In 2007 she moved to the orthopedic surgery department where she became interested in rehabilitation. Wendy received her CCRVN (formerly named CCRA) from Canine Rehabilitation Institute in 2009. She and Dr. Kristin Kirkby Shaw, another CRI faculty member, developed the rehabilitation service at the university. 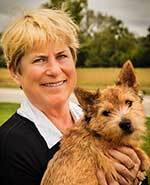 Wendy is currently serving as the Vice President of the Academy of Physical Rehabilitation Veterinary Technicians. 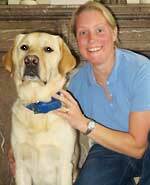 She is an instructor for Canine Rehabilitation Veterinary Nursing and Aquatic Therapy in Canine Rehabilitation. Dr. Felix Duerr earned his veterinary degree in Hannover, Germany. He completed his surgical residency/master's program at Colorado State University in 2007. Dr. Duerr is board-certified with the American College of Veterinary Surgeons (ACVS), European College of Veterinary Surgeons (ECVS) and the American College of Veterinary Sports Medicine and Rehabilitation (ACVSMR). He worked in private practice for four years prior to joining Colorado State University in 2011. Dr. Duerr’s research focus is clinical studies aimed at improving animal health and quality of life related to musculoskeletal problems with a particular focus on osteoarthritis. His clinical interests include geriatric medicine, sports medicine, rehabilitation, orthotics and prosthetics. Current research projects include the evaluation of new treatment options for arthritis, objective evaluation of orthotics and prosthetics in dogs, and the development of novel gait analysis and other techniques used to objectively measure outcome in clinical trials. Dr. Duerr teaches Current Techniques in Clinical Orthopedics: Sports Medicine and Rehabilitation and co-teaches Orthotics and Prosthetics in Canine Rehabilitation with Martin W. Kaufmann and Diagnostic Musculoskeletal Ultrasound with Dr. Myra Barrett. Ashley Foster is a certified canine behavior consultant with 23 years of experience with pet dogs, performance dogs and show dogs. 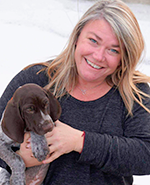 As the owner of Complete K9 Dog Training in Fort Collins, Colorado, and a Board of Directors Member of the Certification Council for Professional Dog Trainers, she specializes in relationship-based, positive reinforcement training for dog owners, veterinarians and rehabilitation therapists. In collaboration with Sasha A. Foster, MSPT, CCRT, she developed Therapeutic Handling for Canine Rehabilitation as a training tool to help rehabilitation therapists promote therapeutic relationships with their patients. Sasha A. 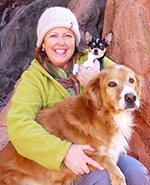 Foster, MSPT, CCRT, is the Rehabilitation Coordinator at Colorado State University Veterinary Teaching Hospital, faculty for Canine Rehab Institute, owner of Canine Rehab Shop, and founder of Canine Home Exercises. 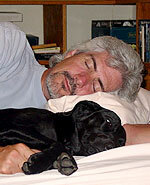 S he has written more than a dozen books on canine physical therapy and fitness including the award winning books The Healthy Way to Stretch Your Dog and Canine Cross Training. She is also a contributing author to the textbook Canine Sports Medicine and Rehabilitation, 2nd Edition (Wiley, 2018). In 2013 she was awarded the first United States patent in canine rehabilitation for "Joint Stabilized Straight Plane Movement Stretching." Her mission is to provide canine companions with research-based, human-quality physical therapy techniques using therapeutic handling methods. Sasha teaches Canine Rehabilitation Therapist, Current Techniques in Clinical Orthopedics: Sports Medicine and Rehabilitation and Canine Neurology and Neuro Rehabilitation. In collaboration with Ashley Foster, BS, CBCC-KA, she developed Therapeutic Handling for Canine Rehabilitation as a training tool to help rehabilitation therapists promote therapeutic relationships with their patients. 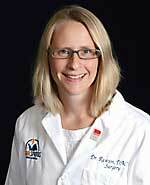 Dr. Hillary is a 2010 graduate of Michigan State University College of Veterinary Medicine. She did her neurology residency training at Colorado State University and the VNC in Phoenix, Arizona. She spent three years as a clinical assistant professor in neurology and neurosurgery at Washington State University and is currently in private practice at WestVet in Boise, Idaho. Dr. Greatting’s teaching interests include clinically applicable neuroanatomy and neurolocalization. Her clinical areas of interest include neuromuscular disease, lumbosacral disease, central nervous system tumors, immune-mediated encephalitis, rehabilitation of neurosurgical patients, and rehabilitation of chronic neurological conditions. Dr. Greatting teaches Canine Neurology and Neuro Rehabilitation. Martin Kaufmann graduated from Century College in 1998 and began his career as an orthotic and prosthetic technologist. In 2004, he received a pedorthotic practitioner degree (C-Ped) from Temple University Podiatric Department and a business degree from the University of Phoenix. Martin enjoyed a rewarding 12-year career designing, fabricating, fitting, and modifying custom orthotic and prosthetic devices, working with several companies including Tamarack Habilitations Technologies Inc., Shriners Hospital, and Winkley's Orthopedics. In 2004, he founded OrthoPets Center for Animal Pain Management and Mobility Solutions, the first full-time veterinary orthotics and prosthetics fabrication company in the world. Martin has lectured at several major universities and consults with hundreds of veterinarians. His specific area of interest is the research and development necessary to advance the emerging field of Veterinary Orthotics & Prosthetics (V-OP). He is a contributing author to the textbook Canine Sports Medicine and Rehabilitation, 2nd Edition (Wiley, 2018). Martin co-teaches Orthotics and Prosthetics in Canine Rehabilitation with Dr. Felix Duerr. 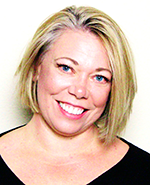 Amber Kenney is a 1997 graduate of the University of Nebraska Medical Center master’s program in physical therapy. On the human side she practices orthopedic and sports medicine physical therapy with a passion for manual therapy techniques. In 2014, Amber completed her certification in Canine Rehabilitation at the Canine Rehabilitation Institute (CRI). She founded Paws-itive Effects K9 Physical Therapy and Rehabilitation in 2015, a mobile canine rehabilitation service. She has been a teaching assistant teaching around the world, including Australia and Germany, at CRI since 2014, teaching Introduction to Canine Rehabilitation, Canine Rehabilitation Therapist, Canine Sports Medicine, Canine Rehabilitation Veterinary Nursing, and Advanced Canine Rehabilitation Therapist. In 2016, she sold her human practice, Physical Therapy Works, to work especially with canines. She lives with her husband and two rescues, Dozer, the pit bull, and Harley, the Shar-Pei/Chihuahua mix. Dr. Amy Kramer graduated with a master's degree in physical therapy from Loma Linda University in 2000 where she was class president and honored with the Research Award for her study of “The Influence of the Protonics Knee Brace on Pelvic Position.” She then completed her doctorate degree in physical therapy in 2004 from Western University of Health Sciences and was given the Leadership and Service Award. In 2016 she opened Beach Animal Rehabilitation Center (BARC) in Southern California. She has been a mentor for CRI students hosting them for their internships, and she offers consulting services for those that need help with the business side of canine rehabilitation. She was a presenter at the Purina Sports Medicine Symposium in 2016, and she is a contributing author to the textbook Canine Sports Medicine and Rehabilitation, 2nd Edition (Wiley 2018). 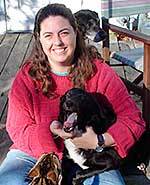 Amy is faculty in CRI's The Business of Canine Rehabilitation course. 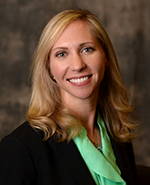 Dr. Stephanie Kube graduated from Colorado State University with her DVM in 2000. She went on to complete a small animal rotating internship at VCA West Los Angeles Animal Hospital in 2001 and a neurosurgery internship at the University of Georgia in 2002. She did her neurology/neurosurgery residency at UC Davis and became a Diplomate of ACVIM (Neurology) in 2005. Dr. Kube served as the head of the neurology/neurosurgery service and the rehabilitation/pain management service at VCA South Shore Animal Hospital in Weymouth, Massachusetts. In 2014, she opened her own practice, Veterinary Neurology and Pain Management Center of New England, located in Walpole, Massachusetts. 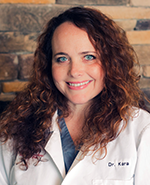 Dr. Kube is a certified veterinary pain practitioner and incorporates pain management into her daily practice. Dr. Michael Lappin is a 1981 graduate of the Oklahoma State University College of Veterinary Medicine. He completed his residency in small animal medicine and a Ph.D. in Parasitology at the University of Georgia, and was board-certified by the American College of Veterinary Internal Medicine in 1987. Dr. Lappin is currently Professor of Small Animal Internal Medicine at the College of Veterinary Medicine and Biomedical Sciences at Colorado State University. His areas of interest include infectious and immune-mediated diseases and feline zoonoses. He is on the editorial board of Feline Medicine and Surgery and Compendium for Continuing Education for the Practicing Veterinarian and is the editor of the textbook Feline Internal Medicine Secrets. Francisco Maia was born in Brazil and moved to the United States in 2005. He received a bachelor’s of science in exercise science from Indiana University in 2009, and a doctorate in physical therapy from The University of Pittsburgh in 2012. Francisco decided to combine his knowledge of physical therapy with his passion for animals, and was certified as a CCRT by CRI in 2015. Francisco has a mobile canine rehabilitation business, TheK9PT, that serves Chicago and nearby suburbs. He joined CRI in 2016 as a teaching assistant for Introduction to Canine Rehabilitation. He also co-teaches The Business of Canine Rehabilitation course. Francisco's other talents include using social media in the field of canine rehabilitation to encourage business growth and increase referrals. He is responsible for CRI’s social media, digital marketing, and online learning operations. Francisco lives in Chicago with his wife and two dogs - Ringo and Lt. Dan. Ellen Martens received her master's degree in physical therapy in Belgium in 2002. She worked with human patients for seven years while she trained in manual therapy, animal physiotherapy (the Netherlands) and animal osteopathy. Ellen worked with both humans until she founded Het Waterhof Animal Rehabilitation Center in 2009. Since then she has worked full-time with animals. Ellen is the founder and president of the Belgian Association for Certified Animal Physical Therapy and has been the physical therapist for the Belgian agility team since 2008. She teaches canine rehabilitation at the University of Ghent and lectures nationally and internationally. Ellen completed her certification at Canine Rehabilitation Institute in 2009. Ellen is an instructor for Canine Rehabilitation Therapist, Advanced Canine Rehabilitation Therapist, and Aquatic Therapy in Canine Rehabilitation. Dr. McCauley is a 1992 graduate of the Colorado State University School of Veterinary Medicine. After spending six years in general private practice, she began to study and conduct research in the field of veterinary rehabilitation. Laurie was the Medical Director of TOPS Veterinary Rehabilitation in Illinois, the first rehabilitation-only practice for 18 years. Dr. McCauley helped design the first underwater treadmill and carpal brace for dogs, and continues to work with companies to create innovative rehabilitative equipment. She is a contributing author to Canine Rehabilitation and Physical Therapy, Clinical Textbook for Veterinary Technicians, and Canine Sports Medicine and Rehabilitation. In 2007, Dr. McCauley and Dr. Chris Zink released Building the Canine Athlete, a therapeutic exercise DVD for canine rehabilitation therapists. She received the 2011 Iams AARV Award for Excellence in the Field of Rehabilitation and the 2015 AHVMA COE Holistic Practitioner of the Year Award. Dr. McCauley is currently running Red Tail Rehab in North Carolina. Dr. Patrice Mich is a graduate of Colorado State University School of Veterinary Medicine. During her 14 years as a generalist, she completed advanced training in veterinary acupuncture and achieved diplomate status in the American Board of Veterinary Practitioners (ABVP). Dr. Mich left private practice to pursue her interest in pain management, completing a residency in anesthesiology and a 2-year fellowship in integrative pain medicine. In 2008, she received a master's degree in clinical science with a focus on clinical assessment, neurophysiology, neuropharmacology, and pain management. She became a diplomate of the American College of Veterinary Anesthesia and Analgesia (ACVAA) in 2009. Dr. Mich was trained as a Canine Rehabilitation Therapist by CRI and in veterinary medical massage through Colorado State University. In 2015 she became a diplomate of the American College of Veterinary Sports Medicine and Rehabilitation (ACVSMR). Dr. Mich's interests include the impact of limb dysfunction or loss on biomechanics, mobility, and long-term comfort; the use of veterinary orthotics and prosthetics as pain management tools; clinical assessment of pain; and regional analgesia. 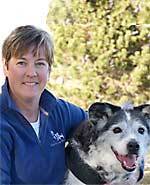 She leads the sports medicine and mobility service at Wheat Ridge Veterinary Specialists in Colorado. She is also a contributing author to the textbook Canine Sports Medicine and Rehabilitation, 2nd Edition (Wiley, 2018). Dr. Mich teaches Current Techniques in Canine Pain Management. Dr. Elizabeth Rawson is a 2002 graduate of Tufts School of Veterinary Medicine. She did her rotating internship at the Animal Medical Center of New York from 2002 to 2003 and her surgical internship at Veterinary Specialists of South Florida from 2004 to 2007. She has a master's of science from the University of Illinois School of Veterinary Medicine and was board certified by the American College of Veterinary Surgeons in 2008. 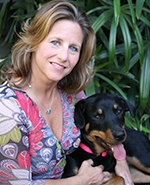 Dr. Rawson has been with the Coral Springs Animal Hospital in Coral Springs, Florida, since 2007 where she does soft tissue, orthopedic and neuro surgery. Her special interests include minimally invasive surgery and regenerative medicine. 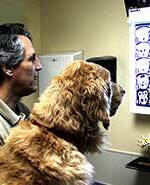 Dr. Rawson was certified by CRI as a Canine Rehabilitation Therapist in 2010. Dr. Kristin Kirkby Shaw is a small animal surgeon and rehabilitation specialist whose career has focused on bridging the gap between these two disciplines. Kristin received her DVM from the University of Florida in 2003, followed by a rotating internship at Veterinary Specialists of Northern Colorado, and small animal surgery residency at the University of Florida. Kristin completed both her MS and PhD at the University of Florida. As a surgical resident, Kristin recognized the need for rehabilitation for her patients and took graduate courses in rehabilitation science, exercise science and therapeutic modalities. She attended Northeast Seminars/ UT Canine Rehabilitation courses in 2007 followed by the Canine Rehabilitation Institute in 2008, where she became a Certified Canine Rehabilitation Therapist (CCRT). In 2009 she became board certified in veterinary surgery (DACVS-SA). Following her residency, she remained at UF as faculty in surgery and founded the University of Florida Small Animal Rehabilitation and Fitness Center (now part of the UF Small Animal Integrative Medicine Service). In 2010 she was awarded the Outstanding Young Alumni Award by the University of Florida. 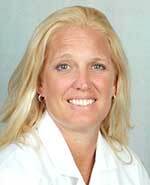 In 2013, she became a Diplomate of the American College of Veterinary Sports Medicine and Rehabilitation (DACVSMR). 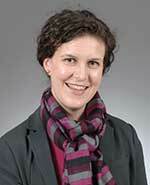 Kristin is has been a surgeon and rehabilitation specialist in Seattle since 2010. She is a surgeon at the Animal Surgical Clinic of Seattle and is the Medical Director of SOUND Veterinary Rehabilitation Center, where she specializes in seeing dogs with hip dysplasia, elbow dysplasia, cranial cruciate ligament rupture, and arthritis. Kristin founded CARE (www.caninearthritis.org) in 2019 to provide resources for her clients and veterinary colleagues, as well as those caring for dogs with arthritis around the world. Kristin is past-president of the American Association of Rehabilitation Veterinarians and is currently an instructor for the Canine Rehabilitation Institute. In 2018 she was the recipient of the John J. Sherman Award for Excellence in Veterinary Rehabilitation. She is a frequent invited speaker at national and international veterinary conferences and has authored numerous journal articles and text book chapters related to veterinary surgery and rehabilitation. She doesn't leave the world of rehab behind when she goes home. Her husband, Aaron, is an occupational therapist/certified hand therapist and owner of MoveMend, physical and occupational therapy practices in the Seattle area focused on bridging the gap between injury and activity. Kristin and Aaron are proud parents of Beans (Frenchie) and Arrow (Labrador). In Kristin’s rare spare time she enjoys running, snowboarding, hiking, yoga, and travel. She is also a contributing author to the textbook Canine Sports Medicine and Rehabilitation, 2nd Edition (Wiley, 2018). Kristin co-teaches Introduction to Canine Rehabilitation and The Business of Canine Rehabilitation course, and teaches Canine Rehabilitation Veterinary Nursing and The Multimodal Approach to the Geriatric Canine Patient. Dr. Joe Spoo is a 2001 graduate of the Iowa State University College of Veterinary Medicine. He is currently a resident in the American College of Veterinary Sports Medicine and Rehabilitation and practices full-time with a focus on the canine athlete. He recently remodeled his practice at Best Care Pet Hospital in Sioux Falls, South Dakota, and added a canine rehabilitation facility — the only one in the region. Dr. Spoo has passion for the canine athlete. In addition to his practice responsibilities he has an active consulting business serving sporting dog owners and the sporting dog industry. He also manages a website (www.gundogdoc.com), a comprehensive resource for all things gundog related. 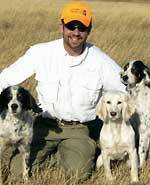 Dr. Spoo is active in the sporting dog world and hunts and competes with the three canine athletes in his life. 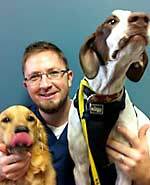 Dr. Spoo was certified by CRI as a Canine Rehabilitation Therapist in 2012. Dr. H. Steven Steinberg is a 1973 graduate of the University of Pennsylvania School of Veterinary Medicine. He interned at The Henry Bergh Animal Hospital in New York City and did his residency at the University of Pennsylvania. Dr. Steinberg completed his board certification in neurology with the American College of Veterinary Medicine in 1980. He was an adjunct professor at the University of Pennsylvania for five years and an instructor in comparative medicine at Johns Hopkins for two years. Dr. Steinberg was a pioneer in the treatment of small animal brain tumors and is internationally recognized for his work on small animal peripheral nerve disease. He created The Veterinary Cancer Registry — the largest Internet site containing worldwide case material. Dr. Steinberg built and managed one of the largest and earliest referral-only specialty hospitals in the country. After Veterinary Centers of America (VCA) bought the hospital, he began working in strategic planning and budget management for the nationwide giant. Dr. Steinberg oversaw the modernization and physical additions to several VCA hospitals including a $1.5 million renovation to their largest referral practice. Mamie graduated in 1988 from the University of North Dakota with a bachelor's degree in physical therapy. Her background in human physical therapy was in outpatient orthopedics and sports medicine with a manual therapy emphasis. Since receiving her certification as a Canine Rehabilitation Therapist in 2011, she has practiced exclusively with animals. 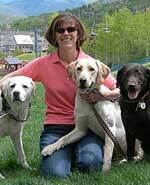 In 2013, she started her own mobile canine rehabilitation practice, Dog Rehab Works, LLC, based in Aurora, Colorado. Mamie assists with both Introduction to Canine Rehabilitation and Canine Rehabilitation Therapist. She teaches the therapist portion of Canine Rehabilitation Veterinary Nursing course. Dr. Bonnie Wright was born and raised in Albuquerque, New Mexico. She accomplished her DVM at Colorado State University and a residency in Anesthesia and Critical Patient Care at the University of California, Davis. 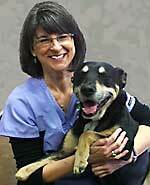 She is board certified in Veterinary Anesthesia and Analgesia. She has earned certificates in Medical Acupuncture, Veterinary Pain Practitioner, Canine Rehabilitation Practitioner and advanced training in interventional canine musculo-skeletal imaging. She works clinically (Colorado Canine Orthopedics) and teaches extensively (internationally) in the areas of anesthesia, pain medicine, medical acupuncture and rehabilitation. She is a member of the Global Pain Council, and active in the ACVAA and IVAPM. One life partner, two adult sons, a horse and a family of dogs keep Dr. Wright busy. Her future plans include an off-grid homestead and farm on the northern grasslands of Hawai'i. Dr. Wright teaches Introduction to Veterinary Medical Acupuncture and other courses in CRI's Certified Veterinary Acupuncture Therapist program. Chris Zink obtained her DVM and PhD from the Ontario Veterinary College. She is a professor at Johns Hopkins University School of Medicine where she teaches pathology and conducts AIDS research. She also has a consultation business in canine sports medicine and rehabilitation, and is the author of several books on canine health including Peak Performance: Coaching the Canine Athlete, Canine Nutrition for Dummies, Jumping A to Z, and The Agility Advantage. In 2007, Dr. Zink and Dr. Laurie McCauley released Building the Canine Athlete, a therapeutic exercise DVD for canine rehabilitation therapists. Dr. Zink also is co-editor of the textbook, Canine Sports Medicine and Rehabilitation, 2nd Edition (Wiley, 2018). Dr. Zink lectures nationally and internationally on the topic of canine sports medicine. She was named 2009 Outstanding Woman Veterinarian by the Association for Women Veterinarian Foundation and her book, The Agility Advantage, was voted Best Dog Publication of 2008. 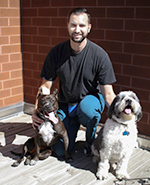 Dr. Zink teaches Canine Sports Medicine and Introduction to Veterinary Clinical Research. Dr. Janet Van Dyke, CRI founder and CEO, writes regularly for DVM Newsmagazine. Recent articles include "Pain management in veterinary rehabilitation" (June 2010) and "Therapeutic exercise in veterinary rehabilitation" (February 2010).